Ah, snails! If I had a bigger space I’d grow some extra crops especially for them and we’d all live happily ever after in a fecund nirvana where swathes of green were exquisitely enhanced by delicate trails of silver. As it is, they plunge me into existential angst as I watch the tattered lace of ex-leaves disappear under a slow wave of grey slime. After much internal debate about killing pests (then externalised), I quickly became a dehumanised killing machine. My only hope of salvation resides in my continuing guilt pangs and occasional decisions to let one go. (Which, remarkably, after reflecting on its brush with death and considering how best to find meaning in a fleeting existence, doesn’t conclude its short lifetime would best be spent creating a great work of literature, but rather devotes itself to rampant reproduction). This offers an excuse to post my entry into last year's Emsworth Village Show in the category of Livestock 1: Best Chicken, so that you can all appreciate how usefully I spend my own fleeting existence. I’ve been told I should just ‘rehome’ them but, short of taking a bucketful six stops on the Piccadilly line, I’m not sure that will do the job. They actually move damn fast, so I think taking snails on the Tube might be more antisocial than getting on having not washed for some time, whilst broadcasting tinny music from earphones turned up extra loud so it can still be heard over one’s yapping into one’s mobile telephonic device, whilst one’s spare hand shoves one fistful of aromatic fast-f0od after another into one’s animated gob thus spraying oily fragments across the carriage. 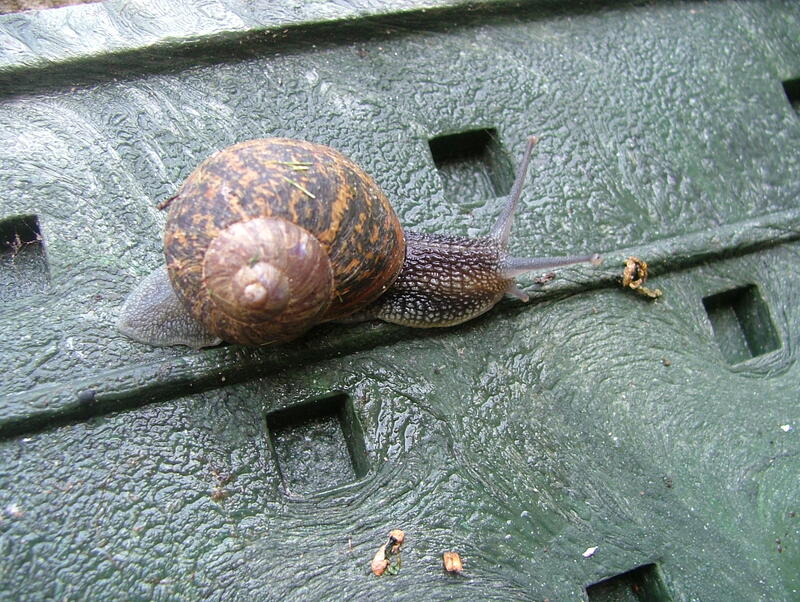 But now, for all embattled gardeners, familiar with the suspicion that snails will always find their way back, there is to be a mass science experiment to test the theory! 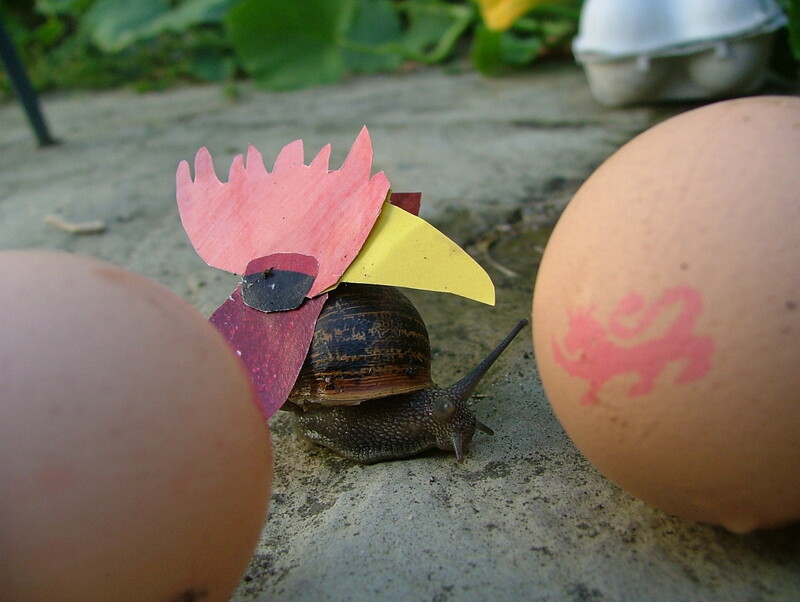 Swap snails with your neighbours and see if they come back. Wife swapping is so last season. I’ve just spent a week in beautiful Devon getting my first taste of field biology, so I’m hungry for more and this sounds like great fun. There are teams and everything! Anyone else planning on joining in? Note: I’m also genuinely pleased to learn there is a publication called Mollusc World. I would love to join in on the fun but my snails are slugs and have no shells so marking them would just be plain cruel. I do let one have a reprieve upon occasion. If they are over 4″ long I figure they must have lived a long life for a slug and toss them into the forest where no doubt they slowly make their way back into the garden in a day or so. I’m raring to go just as soon as I can borrow some nail varnish. I’m also now thinking hard about how one could mark a slug. Thanks for the Garden Rant tip. Now how did the States see the UK news so many days before I did? I’d love to move mine to another plant but alas, I don’t have anything in my plot that I mind them eating – it’s all meant for me to eat. The blog address is for my new blog and the new blog has photos instead of drawings (not enough time for drawings at present) so you may prefer not to click on it. The bit before the P.S. . . .
Because they returned, I started relocating them a bit further away to see if they’d still come ‘home’ but children in the area began to find numbered snails which led to snail hunts and that put their lives at risk (the snails) so now I take them (the snails) the same distance but without numbers. I don’t think they return any more because the snail population in our garden is massively reduced. Must be a bind not having anywhere you can put them. I collect my slugs and snails in a bucket and tip them out on wild ground. It’s a very relaxed area so I often relocate them while still in my nightdress – a sort of morning task comparable with taking a dog for a walk.